Spool cabinets held all types of thread including embroidery floss. It is an exciting moment when a collector finds antique spool cabinets. These popular antiques come in a huge variety of styles but always add quaint country charm when added to a room. What Is a Spool Cabinet? With the invention of the sewing machine in 1844 a new market opened up. Rather than spinning their own cotton or wool threads women began to purchase ready made thread on wooden spools. Spool cabinets were made for the thread companies to store spools of thread. They could be found in the dry goods section of the local general store, each drawer labeled as to the type of thread inside. Most often the cabinets would have three to six drawers. Some antique spool cabinets do not have drawers but the thread is stacked in columns. Each manufacturer tried to design a unique case that would appeal to the customers' sense of style and reflect the quality of the thread inside. Because of this most of the cases were made of higher grade woods like walnut, maple, or oak. Decals would have been applied that advertised the manufacturer and the quality of the thread. Later, spool cabinets for home use were created to store the variety of threads that the seamstress might need. Because of the popularity of this antique there have been reproductions made. Even if the cabinet is original, the decals, lettering, or knobs may have been replaced or updated. For this reason it is a good idea to spend time getting to know what antique spool cabinets should look like. Familiarize yourself with the various fonts that the manufacturers used so that you will be able to recognize that someone updated a Coats cabinet with the font that only Heminway used. Another item that often gets replaced is the knobs. Each type of cabinet had a distinctive knob with very little exception - Victorians were fond of details. There are various reference books that give the details of the knobs and investing in one would be wise. Sometimes doing some research on the company will give you the details you need. For example, if you are being told that a Coats and Clark spool cabinet was circa 1925 a little research would show you that it could not have been made before 1952 when J.P. Coats and Clarks Thread merged. Lettering should be original. If it was restored, was the original font used? Lettering font should match the case and manufacturer. Colored glass inserts, if included, should be original and etched with the company name. Pressed composition drawer fronts with intricate design are desirable to collectors. Advertising decals should be original and in good condition. Hardware, including knobs and hinges, should be original. The more unique the detail, the more expensive the case will be. Original finishes in good condition are the most valuable. Carefully restored spool cabinets are acceptable. It is always a good idea, especially if you are new to spool cabinets, to get a certificate of authenticity or to have the seller make notes on the receipt guaranteeing the authenticity of the piece and the components. The best way to acquire high quality antiques is to build a relationship with your local antique dealers. They can look for items that you might be interested in as they go to auctions and sales. Dealers are also usually networking with other dealers so can spread the word for you. 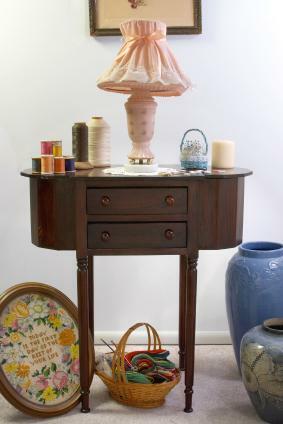 Depending on the size of your spool cabinet you can use it as an end table or side table. The six drawer size are usually best for this. If it is a smaller piece you can display it atop another piece of furniture. The drawers are shallow but can be used to hold small items, papers, and even jewelry.Keep your antiques out of direct sunlight and they will last for generations.